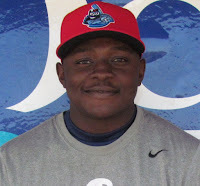 The Phillies’ top draft pick from 2015, Cornelius “C” Randolph, is back in the swing of things following an injury and is helping to lead the first place Lakewood BlueClaws toward a possible postseason berth. After missing more than two months with a shoulder/back strain, the 19-year-old outfielder is beginning to heat up on offensive. Entering action on Wednesday, Randolph was batting .290 in nine August games and sported a five game hitting streak. With their win and the Hagerstown Suns’ (Nationals affiliate) loss on Tuesday night, the BlueClaws took over first place in the South Atlantic League’s Northern Division, leading the first-half division champions by ½ game. Randolph points out that he and his teammates are actively paying attention to the standings and the out-of-town scoreboard on a nightly basis. In 39 games this season with Class A Lakelwood, the five-foot-11 205-pounder is batting .255 with seven doubles, a home run and 13 RBI. According to his manager, Randolph, who was drafted 10th overall last year, has looked like he’s been a contributor all season long for Lakewood. “He came right back and maybe the hits weren’t there the first couple of games but his at bats were definitely there. He’s had some good, tough at bats, especially against left-handed pitchers,” BlueClaws skipper Shawn Williams said. The lefty batting Randolph, asserts that the team is confident as they compete for the top spot in the division with the Hagerstown team that’s already proven worth of the post-season. Doing the little things right could make an impact, but the big things, like pitching and hitting, could be the true determining factors. The BlueClaws have tallied a solid 3.16 ERA along with an exceptional 11.45 K/9 mark, but are batting just .258 with a .676 OPS in nine games this month. With the pitching staff really delivering of late, it may be up to “C” and his fellow batters to barrel up, make the difference and push the team into the playoffs. He’s up for the challenge. Hagerstown’s first-half title has them locked into a playoff spot. If they finish in first place again for the second half, the team with the next best overall record in that division would be chosen as the Wild Card entrant to the playoffs. Lakewood, having finished the first half with a 29-40 record, aren’t a real option to make the playoffs as a Wild Card, as other teams would sneak in ahead of them. The 'Claws will need to stay ahead of the pack in order to play beyond the regular season. -While rehabbing his injury with the rookie level Gulf Coast League Phillies, Randolph was able to bond a bit with this year’s 1st round draft selection, Mickey Moniak. -Randolph found a silver lining with his down time this season. "Down in Florida I learned a lot of stuff just from watching guys play because I couldn’t be on the field. I was just picking up what guys were doing. If they did this right, if they did this wrong, stuff like that. "Hanging around GCL club, the rovers came around and I talked to them a lot. I’d just sit with them and watch the games....Just learning different things about the outfield, where I should be on what plays, the first step, how I’m supposed to take and stuff like that," Randolph said. -Randolph would welcome the opportunity to make up for missed time this year. "I know I need to get extra AB’s and it’s always time to work, so this is what I do for a living and I mean it’s whatever they say I need to do, I’ll be happy to do it," Randolph stated.